Advantage Immigration Inc. is located in Central Alberta and currently serves all regions in Alberta. We work with a range of requests from Temporary Work Permits to Permanent Residence application through many of the categories listed with Citizenship and Immigration Canada. Currently, our main focus is to assist temporary workers, who are already in Alberta, to obtain permanent residence status. With this, they are able to continue work without the need for permit extensions and can be moved around in companies to needed departments without needing government approval. In most cases, both the Employer and the Employee benefit. As a registered member of the Canadian Society of Immigration Consultants (CSIC), our consultants are licensed and are actively involved in many programs to keep updated on programs and regulations. This offers you the highest chance of finding an immigration program that best suits your qualifications and assist you with the best way to submit your application. With a strong record of experience, we are versatile to assist with every category from many different regions in the world, including Europe, Africa, South East Asia and North and South America. Employer Services Are you interested in hiring a foreign worker? Or would you like your temporary foreign worker to remain permanently? Find out about or many services. Worker Services Find out information on employment in Alberta and becoming a Permanent Resident once you have arrived. Family Services Find out about Sponsoring your spouse, parents or children and other special programs. 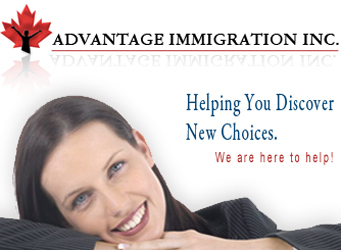 Advantage Immigration Inc. is pleased to launch this Website as of December 1, 2008. Watch for our upcoming posting site where you can find agencies, employers and special services anticipated for early 2009. Have you been a Temporary Skilled Worker for 2 years and not nominated by your employer? You may qualify for the new Canadian Experience Program. Family Sponsorships are now available through the Alberta Provincial Nominee program. Find out more on how you can sponsor your brother/sister, cousins, uncles and aunts. Next information session – January 22, 2009 at Conversa Spanish Center – call for details.